With its dedication to those who rushed to the aid of american airlines flight 1549 coming at the end, director Clint Eastwood's Sully wears its salute to heroism in New York on its sleeve. Sully is an odd film, one of quiet strengths and character weaknesses as it looks at the Miracle on The Hudson. With little insight into the man other than brief flashbacks of his learning to fly and landing an air force jet in peril but with plenty of hints of troubled in his life, Eastwood plays the film remarkably straight, leaving the end result feeling a little muted. 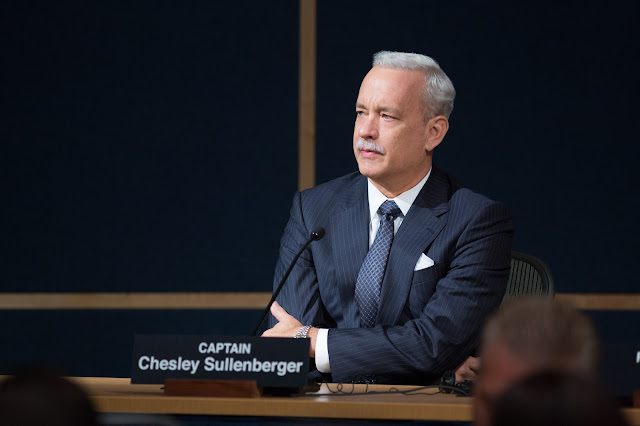 Hanks gives his usual stoic and solid turn as Sullenberger, but a choice to play him as troubled or slightly sullen seems at odds with how little tension there actually appears to be in his background. Calls to his wife (Laura Linney) hint at problems that never seem to manifest, and to be frank, all that's really known about Sullenberger as a result, is what he did for some 208 seconds on the plane, and then consequently worried about thereafter. With nightmarish flashes of jets powering through New York's skylines and crashing into buildings forming Sully's sleeping and waking life, and a passing comment that "New York's not had news this good, especially with an aeroplane involved" hinting at a post 9/11 city struggling still, it's clear Eastwood's Sully is a salutation to the resilience of those within. But that's contrasted with the human factor that Hanks manifests here - it's another every man doing heroic every day things that he's made his career on. Yet even with that approach, Hanks' quiet resilience comes through and bleeds into Sullenberger where the script fails him. As the film leads to its inevitable trial by the National Transport Safety Board, there's a feeling that Sully really has relied on Hanks to carry the character through, even with brief interactions with Eckhart's co-pilot and his long distance wife. Equally, Eastwood relies on the actual drama in the air to provide the emotional meat of the film, playing to generic fears many have on a plane that it all rests on the shoulders and actions of those in the cockpit. With some of the passengers falling into the generic mawkish stereotypes (woman with a baby, trio of late-comers to the flight), there's a tendency toward indifference as the bird strike hits forcing the engines into shutdown. But Eastwood gives it a calm muted sheen that gels with the feel of this languidly sedate film, which is the antithesis to Robert Zemeckis' Flight. As a result, the plane sequence is easily the stand-out of the film - though an over-reliance on re-showing it some three times from different perspectives becomes a narrative weakness and lends a strengthening feeling there is nothing else to the film other than what Sully did in the air. The pitch for Sully is the incredible true story you didn't know, but based on a series of flashbacks, inter-cut narratives and an underwhelming fleshing out of the lead, there's little here that sings as sensational - other than the actions of one normal man "just doing his job". Granted, Eastwood's workmanlike directorial touches during the flight sequences give Sully the frisson of excitement it needs, because in many other aspects, this film's circling in the air, waiting for clearance to land or even take-off.